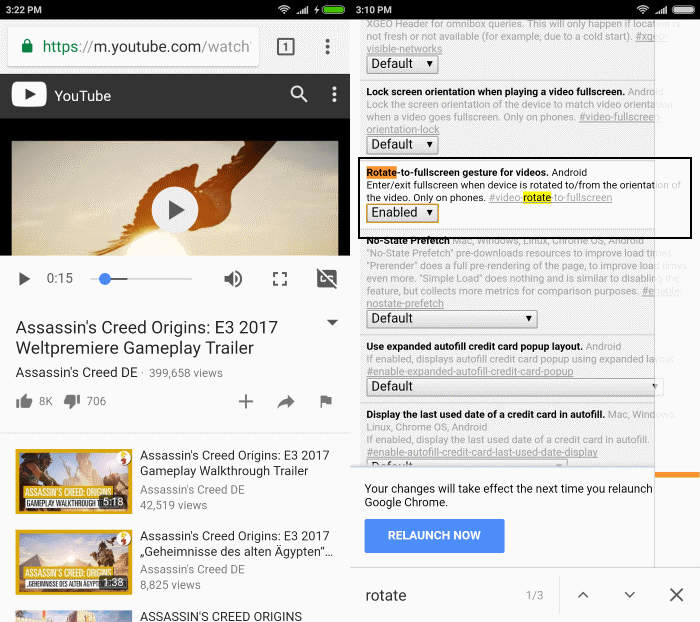 Chrome for Android has a new feature that switches to fullscreen video mode automatically when you rotate the Android device. Note: The feature is hidden behind an experimental flag right now, and only available in development versions of Chrome. I tested it in Chrome Canary, and have not found it yet in Chrome Stable. Also, this is an Android only feature that won't be available on desktop versions of Chrome. If you play videos regularly on your Android device, you may do so in portrait mode, or in landscape mode. Landscape mode offers several advantages over portrait mode when it comes to watching videos, as the extra width it provides is better suited for media playback. While you can rotate the phone on sites to make use of that, doing so won't launch a dedicated fullscreen mode to play the video. You get the browser's address bar, other page controls, and media controls displayed in that mode as well. On YouTube for instance, you have to tap on the fullscreen button to launch that mode, and to get out of if, you have to interact with the page again. You must run Chrome Canary or another development version of Google Chrome on Android. You need to have rotation enabled, and not locked. You need to set a flag on Chrome's experimental flags page. Enter/exit fullscreen when device is rotated to/from orientation of the video. Only on phones. Type chrome://flags in the browser's address bar and load the page. Tap on menu, select find on page, and type rotate. This should jump straight to the rotate-to-fullscreen gesture for videos flag. Tap on the menu underneath it, and set the status to enabled. Once you have done so, you may test the functionality by visiting YouTube. There you may start playback of any video, and rotate your device to switch between fullscreen mode and regular mode using that rotate gesture. This looks like a handy feature to have, as you usually want to play a video in fullscreen mode when you rotate it. I'm not sure how Google will handle situations where this is not the case, or where users just want to use the functionality at times, but not all the time. Does it keep playing sound from the video when the phone screen is turned off ? Is it still in fullscreen and properly oriented when the screen is turned back on ? No, it does not continue playback, but still has the orientation when you turn the screen back on (video is paused though). Is there any to do this in Firefox? PERFECT! Now I don’t need a 3rd party adware viewer app! SO far Canary is working fine. Thank you!